Born in Dumbartonshire on 11 June 1939, Jackie Stewart was educated at Dumbarton Academy. Suffering from dyslexia, he left school at the earliest opportunity and entered his father's business, Dumbuck Garage, as an apprentice. The firm sold Jaguars and Jackie soon became involved in motor racing (like his elder brother) with Ecurie Ecosse. But his brother was injured in a crash at Le Mans and Jackie was encouraged to take up a safer sport - he nearly made the UK Olympic team at shooting in 1960. However, in 1963, having taken up an offer to test cars at Oulten Park, he impressed Ken Tyrrell who offered him a place on his F3 team. Stewart moved on to BRM and Formula 1 in 1965 and won his first Grand Prix at Monza in Italy, finishing third in the World Championship in his first season. He later rejoined Ken Tyrrell and won 27 Grand Prix races out of 99 starts. He became World Champion in 1969, 1971 and 1973 and was runner-up in 1968 and 1972. He retired after winning his last Championship. His total of 27 wins was not equaled for 20 years. Early in his career, following a crash which showed him the poor standard of safety and medical care at races in those days, he started to campaign vigorously for improved standards, with considerable success. He once said "The champion doesn't judge himself against others. He measures himself against his own standards." 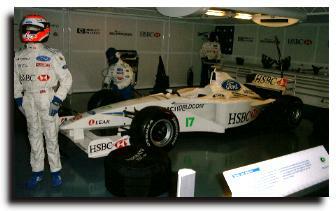 In 1999, Stewart sold his Grand Prix racing team to Ford for 100 million pounds. 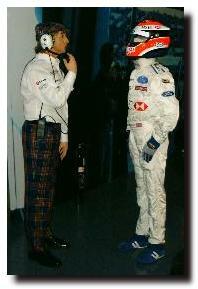 Stewart remained as chairman of Stewart Grand Prix with his son as deputy chairman. The tartan on the cars was replaced by the Jaguar symbol and dark green of that famous car company, which is now a Ford subsidiary. The Stewart family got a shock in 1999, however, when son Paul was diagnosed with cancer. Jackie has commented that the fight (so far successful) against the disease changed a lot of priorities.